Although I definitely do not consider water a “yawn in a glass,” if you go plastic-free or zero-waste, you do limit your beverage options. Fortunately I love tea with milk and I can buy loose leaf tea in bulk and milk (from pastured cows) in a returnable glass bottle. (I could give up chocolate if I really, really had to and perhaps I could even cut all sugar, but giving up milk in my tea would be like kicking heroine.) Occasionally you may want something besides water, milk, tea or coffee. Something fizzy. To create fizzy drinks, you can ferment a few different foods, such as beets. However, beet kvass tastes sour and I like mine strong. If you need a substitute for soda, you’ll want to try making ginger beer or fermented lemonade instead. I love the low-tech aspect of beet kvass. You need only a glass jar to ferment it. You don’t heat the water. You don’t cook anything. You don’t can it in a hot water bath. You literally just throw some stuff in a jar and wait a few days for the microbes to work their magic. I drink a little beet kvass almost every day for both the taste and the microbes. You can read about the health benefits of probiotics on Sandor Katz’ website. I made a vat of this stuff. You may not want so much, so I’ve adjusted the amounts to render a smaller batch (thus the discrepancy between the photo above and the list of ingredients below, in case anyone wonders…). 1. Chop beets into 1/2-inch cubes. Don’t worry, your hands won’t look like this for long. 2. 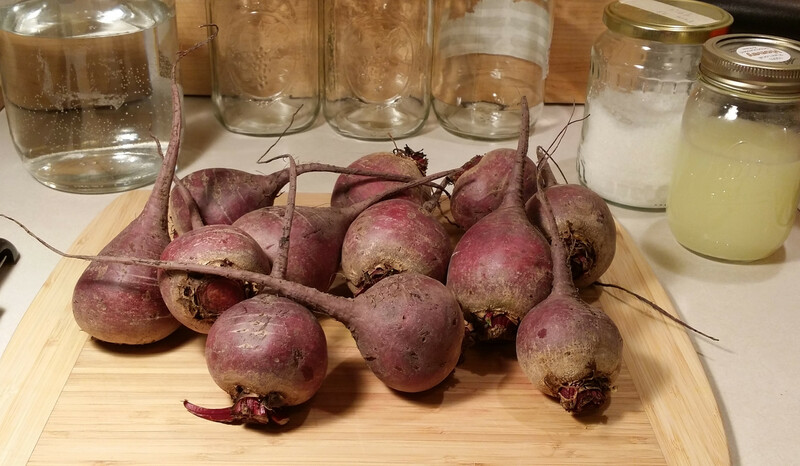 Place beets, salt and whey in a 2-quart glass jar. Fill with water, stir and cover. If you have a weight to prevent the beets from floating to the top of the jar, put it in. The trick to fermenting vegetables is keeping them submerged in liquid. I didn’t have a problem with the beets floating up to the top this time. But a weight can serve as an insurance policy. 3. Set the jar aside at room temperature. I leave mine out on the kitchen counter or table. You may have to “burp” it every day—in other words open the lid—to release pressure. My jar has a rubber seal, which helps release some of the CO2. 4. In two to three days, after the kvass has developed a dark color, open it and taste. Uh oh! Mine has developed some crud (looks like harmless kahm yeast) on top. (Of course this would happen for my blog post.) Don’t worry! You can scoop off these unwanted microbes and the ferment will be just fine. I waited to write this post after I had consumed every last drop this batch, and I didn’t die. 5. If you prefer a stronger taste, let the kvass ferment for longer. I leave mine for as long as a week. Once it has developed the taste you like, strain it. I use a colander placed over a large bowl. 6. 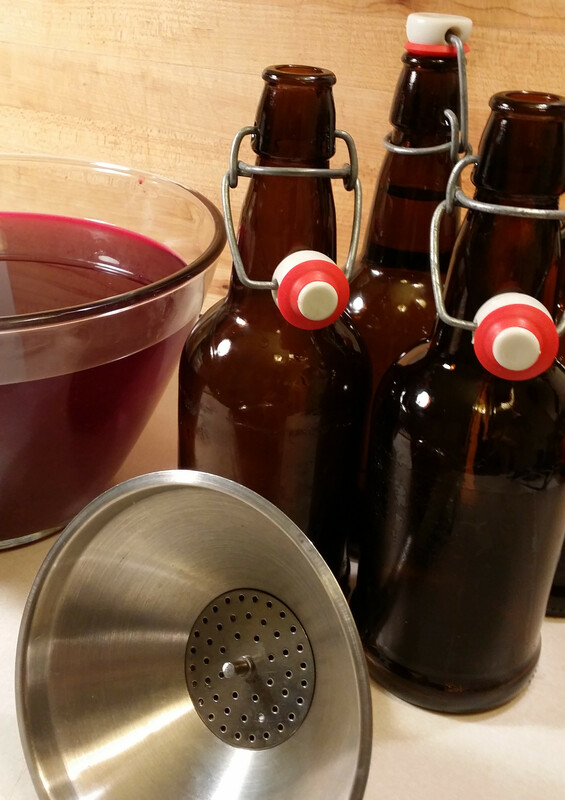 To develop carbonation, transfer the kvass to bottles that have rubber seals. Mine are empty Revive Kombucha (a food group for my older daughter) bottles. The two dollar bottle deposit costs less than buying similar bottles. Use a ladle and funnel if you don’t want everything around you to turn reddish-purple (such a beautiful color though!). If you don’t want carbonation, put your bottles in the refrigerator now. This will retard the fermentation. 8. Place kvass in refrigerator. You’re done! 9. Actually, you’re not necessarily done. You can make a second batch with these same beets. This subsequent batch won’t taste nearly as strong. Return beets to the jar, add water only and follow steps 3 through 8. My second batch wasn’t very fizzy and didn’t taste as strong (or as good) as the first batch. That’s interesting, i never heard kvass before. Well i’ve heard about japanese umeshu, but not kvass. Is it a refreshing beverage like cola or have alcohol content like umeshu? I’m curious, i really want to try this, but unfortunetly beet is kind a expensive here..
Kvass is refreshing but sour. It doesn’t contain alcohol. I’ve never had umeshu, but I just looked it up in one of my books and it sounds really, really good! With plums though, it must be sweet. Kvass is not sweet at all. It’s has a flavor more like sauerkraut or kimchi. I just got Sandor Katz and Sally Fallon books last year when I attempted my first batch of sauerkraut. Fermented Foods are Fun!!! Thx for sharing this! Thanks for bringing those up. I have those same books and I intended to mention them in the post but completely forgot. I agree. Fermenting is so fun! And so healthy! I have canned fruit before and it’s fun too but a lot more work. This is our absolute #1 favorite drink in our household and I can’t keep up with my husband’s consumption (the term “medicinal” — and therefore taken in small doses — doesn’t register with him!). This post was helpful in a couple of ways — I like the container you use to ferment — my screw top jars get pretty cruddy and since I do not have a dishwasher and have found that boiling the doesn’t get them clean enough, maybe the spring top jars would work better. Also I like the re-using of the kombucha bottles — I purchased some plain ones through Amazon but a couple of them won’t close properly! Plus I think the darker color is better for many reasons. As to your question, I use Sally’s approach and keep a “continuous brew” going so that I don’t have to depend upon whey. Often I will pour a little bit of sauerkraut or fermented veggie juice into the kvass to give it a kick. We like ours bracingly tart, too. So much so that after fermentation and carbonation I will add vinegar! Also pre-ferment I add garlic and dill and onion and all sorts of other sour things. Mmmmmm! Thank you so much for all the info! I will try the continuous brew. It sounds much more efficient. And I’ll add garlic too. Yum! I love the kraut juice idea too. That’s brilliant. You and your husband must be very healthy drinking so much kvass. I do like the kombucha bottles. I’m having a hard time finding a natural bristle bottle brush to clean them though, and my dishwasher doesn’t work well at the moment. I’ll have to look online. Well, that’s all I’ve found too. I have a few ferments going just now, and will try the beet kvass when beets are in season here. Thanks for a good step by step description of the process. Yes, you have to like beets. Actually, it does kind of taste like fizzy beets. It really smells like beets too. Thank you for the link to the parsley information. I need to eat more of it and it goes with so many dishes. It might fun to try a ferment with some parsley too. It was MioEnergy, a kind of ‘juice’ concentrate you add to water with energy drink ingredients add in that said the ‘yawn in a glass’ thing. Awesome recipe. My gf loves beets, so I have to give this a try. Thank you! I tried googling that tagline and found only articles critiquing Google Glass as dull. I googled MioEnergy just now. OMG. Disgusting-looking stuff! I can’t believe people fork over their hard-earned cash for that! Never heard of this before, but I am a big fan of beets, so I will definitely have to try this! Great! I love the stuff! I have tried making kambucha, but when it came time to drink it was a little scary (that slimy jellyfish on top!). Never heard of kvass. Thanks for the recipe, I can’t wait to try. I haven’t tried kombucha but I would like to. I think kvass is easier. For one thing, you don’t need a SCOBY. And I didn’t write this in my blog, but if you don’t have whey, you can add a bit of extra salt and it should ferment. I haven’t tried that though. I always use the whey because I know it works. I’m always disappointed when I see unwanted crud at the top of my ferments (like in this post). But I scrape it off and eat or drink the stuff. I haven’t had anything too scary-looking happen though. Thanks for the comment! phickle is a great blog if you want to know more about fermenting. I do kombucha, but as we’re not big beet fans, I don’t do much of anything with them. I drink loads of water and actually prefer the ‘yawn in a glass’ over anything else. I just recently made my first batch of Raspberry Kvass using this recipe – http://realfoodrn.com/how-to-make-raspberry-kvass/. It did not call for salt and the one time I did try Beet Kvass I decided that I didn’t care for the saltiness of it. Instead of salt, this recipe calls for Raw Honey and I assume is depending upon the natural yeasts that are found on most real food fruits & veg for it’s ability to ferment. Like Kombucha, it seems that all of the sugar is digested during the brewing process. My Kvass is Not sweet at all. In fact, it’s pretty bland. Since I can’t leave a recipe alone (LOL) I also added one small diced beet to my Raspberry Kvass. After 3? days I refrigerated it. A few days later I added a flat can (I know, I know…) of Pineapple Tidbits to my brew. I left it out another day or so to continue the ferment and then stuck it back in the fridge. It doesn’t have a huge flavor impact but I like it and it is refreshing when I’m tired of drinking just plain water. I am planning on trying to continuous brew it by straining out the older fruits/veg and adding new ones when the liquid level gets low. At the moment I’m using a half gallon canning jar for mine. I leave the (plastic) lid screwed on loosely while fermenting and then tighten it down some when it’s refrigerated. Thank you for the link and the comment. I must try this! My kids will not drink my beet kvass but they might drink this. I love the continuous brew! I just started making mead (water + raw honey) and I’m trying a continuous brew. The yeasts in the honey work like magic, converting the glucose to alcohol. The result is a sweet bubbly wine. I bought a cantaloupe to make fruity mead, but now you have me thinking I should add raspberries. That would be so good. Oh, and I read recently that you can make scrap vinegar out of the fruit left from fermented drinks like fruity mead (and I imagine your kvass) IF there’s any life/sugar left in them. My Ukrainian-Russian boyfriend likes traditional kvass, made with stale bread, but I’ve made it just once. It’s an acquired taste though. Have you tried that? So many amazing ferments to make! I love the whole “Mad Scientist” part of it! The more you do the braver you get. I finally got around to making sauerkraut a few months ago and it was a resounding success. Took me a Long time to get brave enough but I am so glad I finally took the plunge. As far as sugar left in the fruit for Kvass – I would count on much sugar there! I ate some of the pineapple and it had almost no flavor at all let alone any sweetness. Very interesting. I plan on eating the “old” fruit but it is pretty Blah. As soon as this current batch gets a little lower I am going to add some fresh Blackberries that I bought today and a sliced apple. Should be fun to see how long I can keep this particular brew going! I love the mad scientist aspect too. It’s really fascinating what goes on in a ferment. That’s great about your sauerkraut. I started some just this morning. Besides my sourdough, I make sauerkraut more than anything. I’m also trying to keep my starters going for a long time, years I hope. You can use a big glass jar. Rinse it with hot water before putting any ingredients into it to get rid of some bacteria (prevents the mould to develop). Thinly peel beetroots and cut them into 2/3 pieces (2 pieces for small beets and 3 pieces for bigger beetroots). Place beetroot in the jar, add garlic and all spices in between them, Add cool water and cover with a cheesecloth. Put in a warm place (next to refrigerator or in the kitchen). Leave it for 3-5 days (the longer it stays, the more sour it becomes). Don’t worry if there’s some foam at the top after 1st day or 2nd – this is normal and will disappear, you can always get rid of it if you want. The spoon has to be very clean, though, as we don’t want to add any bacteria to it. The kvass can make bubbles (like champagne) – it is a very good sign. If there’s some mould then something must have gone wrong and you need to throw the kvass away and star all over again. Please remember to use clean utensils. Thank you for the great recipe. Long time fan girl – first time commenter. I started my first batch of beet kvass today and I’m excited to see how it turns out. I like roasted beets but not in the summer – especially in the middle of summer, in Denver, in my beloved house that doesn’t have air conditioning! So I was looking for something to do with my beets from my CSA and I’ve found it. With my Iimited experience with fermenting, my biggest lesson has been the longer, the better. Fermenting is very psychologically satisfying – it’s artistic, organic, natural, literally shows me the value of patience, of waiting. Thank you for your wonderful blog, your commitment to lessening your impact on the Earth, and your immense generosity. I used Mason jars and have to burp them daily, when I’m done fermenting should I just leave the lids off? I’m concerned if I don’t the pressure will continue to build.? The ‘mold’ is Kahm yeast. It is not dangerous like mold is, just doesn’t taste good. Try star anise in the kvass and fresh ginger. Does the garlic make it taste very garlicky? I absolutely adore your humor and how hilarious and informative your posts and comments are awesome magnificent Anne Marie! What do you do with the beets after the second batch? Can you eat it like sauerkraut? Thanks! maybe it’s already written and I should drink a second cup of coffee, but I can’t find what to do with the beets after 1st or 2dn batch? Can you use them and cook them in a soup, or other recipes or they’re tasting bad and should go to compost? thanks for your website! !